We specialise in the sale of good quality used Military vehicles, plant and equipment as was formerly owned by NATO forces and which has done little work during it's life..
- A wide selection of plant machinery including a range of Caterpillar, JCB, Volvo, Land Rover, Bedford products. Export Licences - How long does a licence last? Export Licences - How much does a licence cost? Is there a warranty for vehicles? 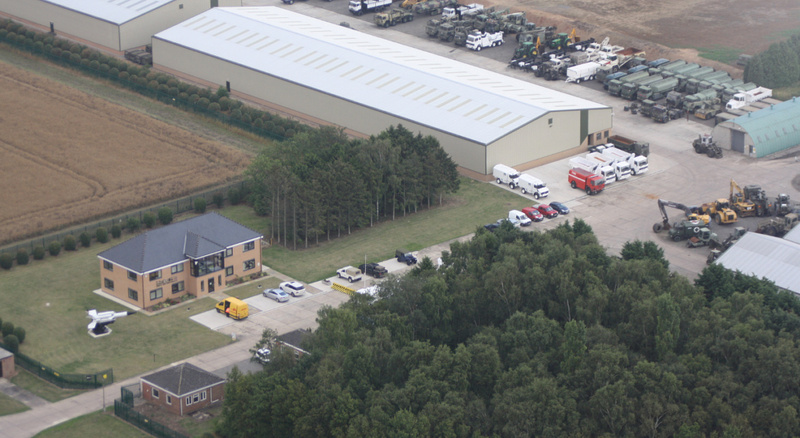 Answer - We are located in South Yorkshire just outside Doncaster near the village of Misson. For maps and detailed information on how to get to us follow the visit us link on the main menu bar. Answer It depends on whether you are buying and or shipping Military or Civilian vehicles and equipment. If the goods are civilian e.g. Caterpillar Plant or Civilian trucks then NO you should not need an export licence, we can help advise. For information on how to complete the end user document click on the link below. To download a copy of the End User Forms use the link provided below. Question - Export Licences - How long does a licence last? Answer - A licence once granted is valid for 2 years or until it is exhausted i.e. all goods stated are shipped or it expires or is revoked due to changes in the status of the destination concerned e.g. EU/NATO embargo is put in place. Question - Export Licences - How much does a licence cost? Answer - There is currently no fee for an export licence however, BIS is considering levying a fee in 2012 for each licence application. To assist customers we have produced an in-house guide which clearly identifies the rules in a simple format. Answer - Yes - We can arrange for an independent inspection to be carried out on equipment to be purchased both before and after preparation. Answer Yes we can accept letters of credit for balance payment, all initial deposits are preferred to be made by bank transfer unless the buyer is very well known and trusted. Ex means from. Works means factory, mill or warehouse, which is the seller's premises. EXW applies to goods available only at the seller's premises. Buyer is responsible for loading the goods on truck or container at the seller's premises, and for the subsequent costs and risks. In practice, it is not uncommon that the seller loads the goods on truck or container at the seller's premises without charging loading fee. In the quotation, indicate the named place (seller's premises) after the acronym EXW, for example EXW Kobe and EXW San Antonio. The term EXW is commonly used between the manufacturer (seller) and export-trader (buyer), and the export-trader resells on other trade terms to the foreign buyers. Some manufacturers may use the term Ex Factory, which means the same as Ex Works. The delivery of goods to the named port of destination (discharge) at the seller's expense. Buyer is responsible for the cargo insurance and other costs and risks. The term CFR was formerly written as C&F. Many importers and exporters worldwide still use the term C&F. In the export quotation, indicate the port of destination (discharge) after the acronym CFR, for example CFR Karachi and CFR Alexandria. Under the rules of the INCOTERMS 1990, the term Cost and Freight is used for ocean freight only. However, in practice, the term Cost and Freight (C&F) is still commonly used in the air freight. The cargo insurance and delivery of goods to the named port of destination (discharge) at the seller's expense. Buyer is responsible for the import customs clearance and other costs and risks. In the export quotation, indicate the port of destination (discharge) after the acronym CIF, for example CIF Pusan and CIF Singapore. Under the rules of the INCOTERMS 1990, the term CIF is used for ocean freight only. However, in practice, many importers and exporters still use the term CIF in the air freight. Answer - Yes, we can arrange shipping for customers. Goods generally go RORO (Roll On Roll Off) or by container depending on the size of the shipment. RORO is generally the cheaper option. We can also arrange for insurance if the customer requires it. Answer - The Incoterms rules or International Commercial terms are a series of pre-defined commercial terms published by the International Chamber of Commerce (ICC) widely used in international commercial transactions. A series of three-letter trade terms related to common sales practices, the Incoterms rules are intended primarily to clearly communicate the tasks, costs and risks associated with the transportation and delivery of goods. The Incoterms rules are accepted by governments, legal authorities and practitioners worldwide for the interpretation of most commonly used terms in international trade. They are intended to reduce or remove altogether uncertainties arising from different interpretation of the rules in different countries. INCO Definitions as used by (Ex ARMY UK) L.Jackson and Co. Ltd.
Answer - Most of our vehicles are ex. military reserve stock which means that they have not seen active service instead being kept back "in reserve" hence the term, to perform localised duties or to be sent in as replacements for vehicles in service which need to be replaced. Question - Is there a warranty for vehicles? Answer - No warranty available as this item is used ex military. All vehicles will be checked through before it leaves to make sure that faults are fixed. Question - Open for other partners? Answer - Yes, always. The more people working on this the better. Send us an email and we will be in touch. Copyright © LJackson and co ltd ®"